As the warm weather starts to show it’s face around here, I have noticed a change in my food cravings. I no longer want those heavy comfort foods. I want fruit, fresh vegetables and the smell of something yummy grilling. Maybe it’s a subconscious thing…but the healthy eating instinct kicks in as the layers of clothing are no longer needed and that sweater can’t hide the truth about how many scoops of mashed potatoes you consumed with your meatloaf. While I am NOT a fan of summer, I AM a fan of the Farmer’s Markets and road-side stands that pop up everywhere during it. I love driving by, seeing what looks good and planning my dinner for that night based off of what I find. Nothing beats fresh zucchini, red ripe tomatoes and just picked string beans to me. There is also something about all of the colors and smells that just make me happy. Last year, I came to appreciate these stands even more since I was a vegetarian. The amount of fresh fruits and vegetables I purchased every week was insane. Between how expensive they can be and how quickly they spoil, I liked not having to go all the way to the grocery store to get them. There is also something about buying these items from the person who grew them that makes them taste better to me. You can save so much money buying them fresh, in season and directly from the farmer. Last year, I blogged about GMO’s and organic foods. It was something that became important to me as I began to take care of my body. I was happy to learn about all of the organic Farmer’s Market’s that were close to home because I didn’t like having to rely on the grocery store as my only option for obtaining these items. Plus, I think it’s so much nicer to support local farmers than it is to pump money into these big name companies. So, as the weather warms up I’ll be getting my charcoal ready and sorting through my vegetarian recipes so I’ll be ready when my favorite part of summer is set up roadside. 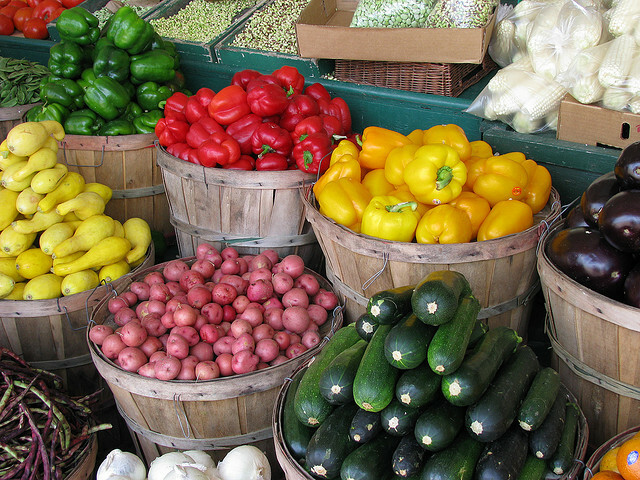 Want to find a local Farmer’s Market near you? Check out Local Harvest. This is where I get my eggs and vegetables. Last year was kind of rough because of the drought, but I’ve already been hitting em up this year. There’s only a few and believe it or not, the majority of folks here have their own gardens. To much work for me though, Haha. Hahaha…..we didn’t win :( Thanks for the compliments on my cooking. I wish I had more time to cook like I used to…sigh.